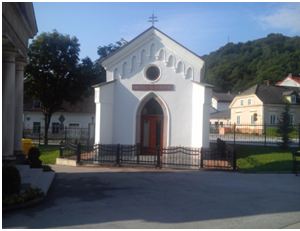 Catholic cemetery Dubovac was established on Novemeber 1st. 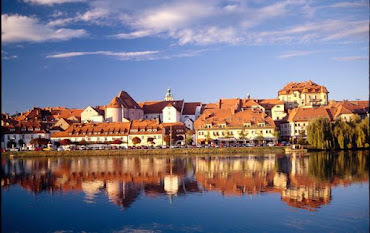 1820 and situated an old Karlovac hospital and almshouse. The Mausoleum of the family Vranyczany-Dobrinović was built in 1870. It was also designed by the Viennese architect Otto von Hofer.Dragan Vranyczany built the family tomb Vranyczany-Dobrinović, in the period from 1883 to 1881. 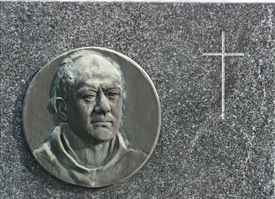 The tomb was designed by the famous architect Otto von Hofer. The family tomb M. Vuković is the oldest burial site located on the new cemetery. The tomb was built by Vjenceslav Turković, famous Karlovac merchant and politician, during his life time (1826 to 1902). Turković family Mausoleum was built by Vjenceslav Turković (1826 to 1902). Vjenceslav Turković was a large estate owner, entrepreneur and a shipbuilder. The mausoleum was built as an early historicist building around 1870's. 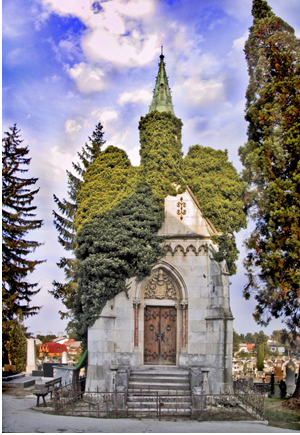 The mausoleum is currently owned by the family of M. Vuković. 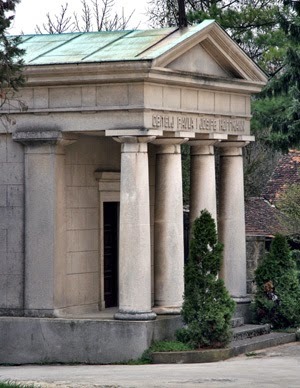 The Türk family tomb, built in 1892, is the work of the famous Zagreb architect Kuna Widman. The grave site of Dr. Ivan Banjavčić (1843 to 1913). Dr. Ivan Banjavčić was a famous attorney and politician. He was the mayor of Karlovac from 1903 to 1909. His contributions include the initiation of the construction of a power plant on the river Kupa, after which the town began to develop as an industrial center. His property was bequeathed to Matica Hrvatska and Society of Saint Jerome. 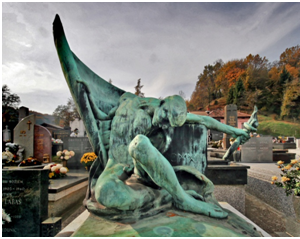 The grave site sculpture is a monument, built by the sculptor Ivana Kerdić. The tomb of Antun and Elvira Jordan. Antun Jordan was a famous lawyer and mayor of Karlovac from 1886 to 1889. 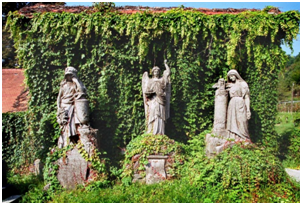 This family tomb is considered one of the most beautiful monuments in the cemetery. It was built at a time, when the whole cemetery was planned to be walled. The gravestone of Antun Jordan (1834-1895), mayor, attorney, landowner and chess player and wife Elvira Ressman (1851 to 1925) was constructed during her life in the late 19th century. Mausoleum of the Hoffmann family was built in 1929 following the design of Trepper, a construction engineer from Zagreb. The mausoleum was built by Julian Jamnicky, Karlovac's architect and co-owner of a construction company called Kabalin-Jamnicky. 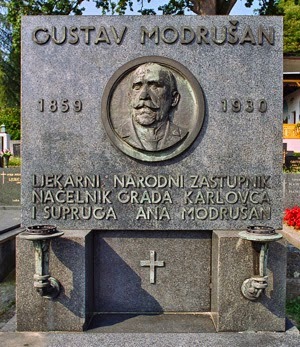 The grave site of Gustav Modrušan (1859-1930), a pharmacist and Karlovac mayor for two terms (1916 to 1919 and 1929 to 1930). Modrušan is credited for the expansion of green spaces in the city. The Portrait in the relief work is of an unknown author. The Gravestone of Gustav Modrušan (1859-1930), mayor, pharmacist, Member of the Parliament, humanitarian and entrepreneur. 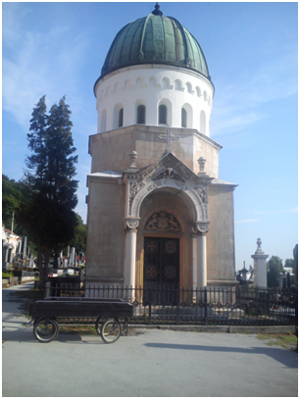 The tomb was built in 1935, designed by a certified architect from Zagreb Ivo Velikonja. The grave site of Gjuro (Đuke) Bencetić (1881 to 1940). Bencetić was from 1924 the Guardian and pastor of Holy Trinity parish. He was a distinguished public servant and benefactor. The portrait in relief was made by Dragutin Laškarin. Gravestones Gjure (Đuke) Bencetića (1881 to 1940), a Franciscan friar, benefactor, and missionary, was commissioned by the „Croatian Woman" society. Medallion with a portrait is the work of Karlovac professor and sculptor Dragutin Laškarin.